Load shedding is back, and nobody's happy about it. But unless you have the money for generators, solar installations, or other expensive alternatives, the reality is that you are at risk of losing power for periods of time until the national grid is stable again. In our tech-driven world, it's really disruptive to have a few hours without electricity. But losing power doesn't necessarily mean losing productivity. In this article, we look at some key strategies for minimising the blow of load shedding, while also making the most of the electrical downtime. 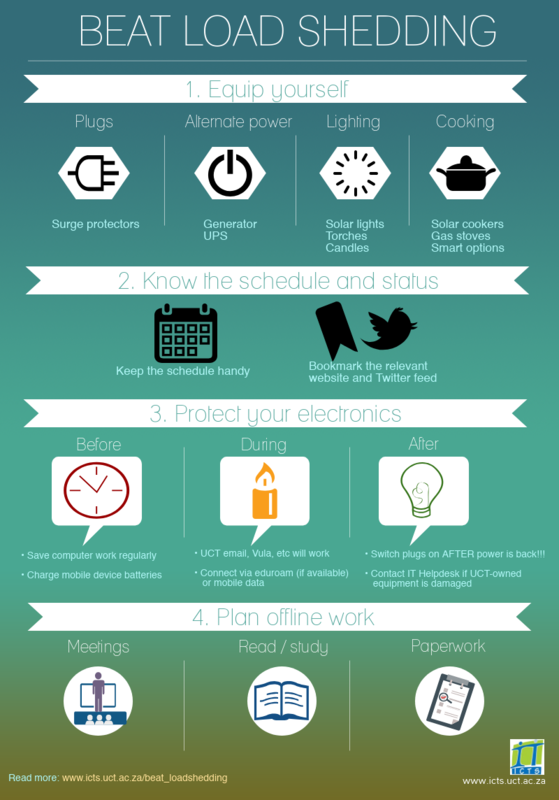 The current load shedding is subject to fairly reliable schedules - so you can plan ahead. Whether you're supplied by the City of Cape Town or Eskom, keep your schedule close at hand - whether printed or on your mobile device. You may only log a call for UCT-owned equipment - not for your personal devices.